News: Print Lottery opens this weekend! 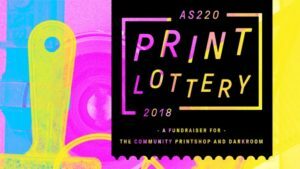 The AS220 Community Printshop and the Paul Krot Community Darkroom are publicly accessible art-making spaces that have been serving artists and makers of all abilities, ages, and backgrounds since 1996 and 1994. 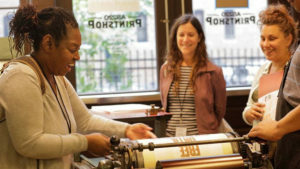 Both had humble beginnings in the basement of AS220’s Empire Street complex, and have since provided thousands of people with open and affordable access to tools, space, and knowledge for the processes of letterpress, etching, relief, silkscreen, and photographic darkroom printing. How does it work? Print Lottery features over 100 2D works donated past and present by AS220 members, monitors, employees, and volunteers. The show will be up for the month of September — all month! free and open to the public! — to visit and check out the amazing print tramadolmain work of AS220 artists and residents. Gallery hours  are Weds-Thurs 12-4 pm, Friday Saturday 2-6pm at 233 Westminster Street. Buy a $100 Print Lottery ticket online. At the end of the month, we will raffle off the ENTIRE COLLECTION as a fundraiser for AS220 Industries! Print Lottery Night is Friday September 28, 6pm-8pm. 100 tickets, 100 prints – you’re guaranteed to win! Check out the prints on Friday, September 7th and visualize the one you want to go home with. Make it happen. You can do it. Donate to our online fundraiser on chuffed.org – get some cool perks as a way of us saying “THANK YOU!”. Maybe one of those Shepard Faireys that you’ve always wanted, or an AS220 original! More perks added regularly! 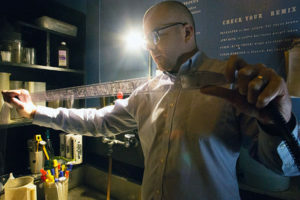 Your contribution helps us ensure that these two unique spaces remain open, affordable, and accessible for all people to realize their full creative potential.